Dear Readers, there is nothing like a wildfowl collection for releasing new species into the unsuspecting wild. 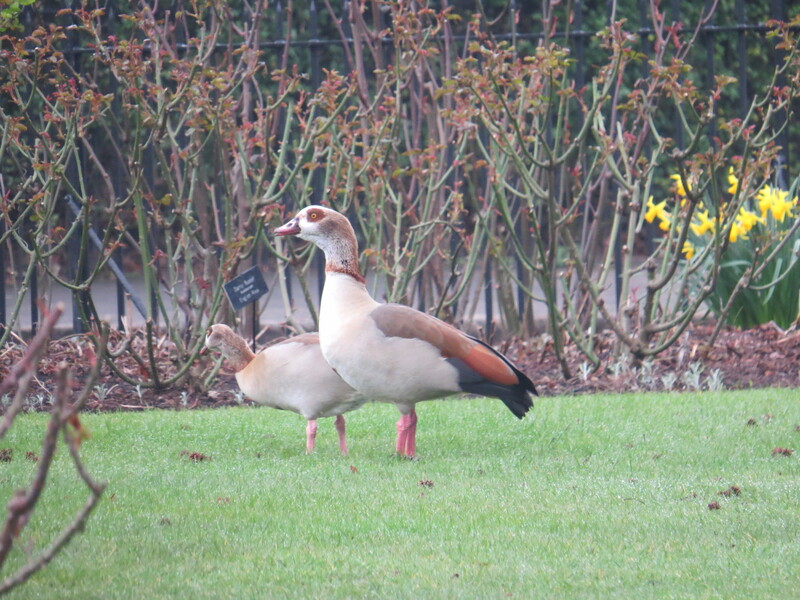 Take these handsome Egyptian geese, seen strutting their stuff in Regent’s Park a few weeks ago. The owner of Holkham Park in Norfolk introduced a few pairs of these birds in the 17th century. They had their wings clipped, but the lust for freedom is sometimes very strong. By the 1890’s there were 7 in Clissold Park and several in the London Royal parks. A hundred years later, there are some 1100 breeding pairs in the UK, and they have the dubious distinction of being included in my ‘Field Guide to Invasive Plants and Animals in Britain’, They are particularly common on the Norfolk Broads, and are very territorial, to the disgust of our shyer native geese. Not content with seeing off an intruder on the ground they will take to the air for a ‘dogfight’, and have been known to attack drones. Egyptian geese pair for life, and both take care of their offspring. They are also very vocal birds: a pair flying overhead and honking to one another sound exactly like a dustbin lorry reversing into a gap. The female has a particularly raucous quack, especially when with her goslings – she seems to be in a state of frenzied maternal concern for most of the time. Incidentally, the Greek generic name ‘Alopochen’ means ‘fox goose’, probably referring to the russet colour of the male’s back. 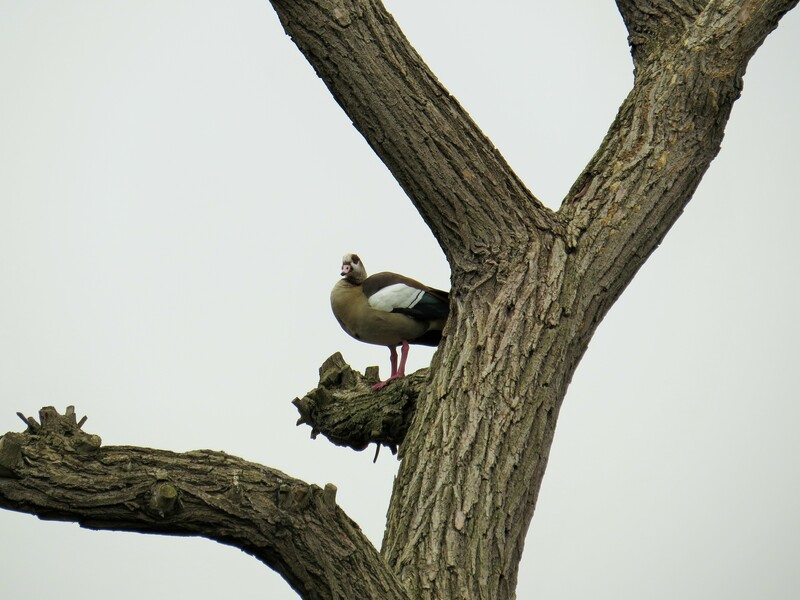 Egyptian geese will sometimes make their nests in hollow trees, which, given the size of the bird is surprising. Maybe the one below was scoping out a suitable tree. 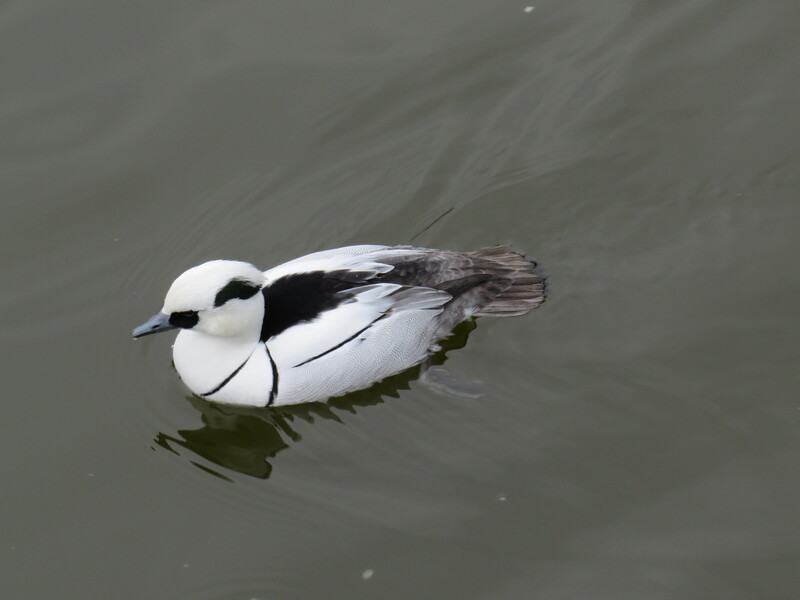 And while we’re on the subject of hole-nesting wildfowl, who would have thought that the little beauty below would also be included in my Invasive Species book? Yes, the mandarin duck, possibly the most exotic and beautiful of all wild duck species, is becoming a pest. There are 7000 feral mandarin ducks in the UK, and my book suggests that they are problematic because they compete with native birds for those all-important nest holes. May I put in a gentle suggestion that if we didn’t keep cutting down our forests (as we have done, incessantly, for the past two centuries at least) there would be plenty of trees with holes in them to go round? Mandarins first bred in captivity in London Zoo in 1834, and there are now at least 50 wild breeding pairs in the London area, with approximately 2000 breeding pairs in the country as a whole. As you might have seen on various wildlife programmes, the ducklings of hole-nesting species have to fling themselves from their nest hole to the ground once they’re ready to go – one reason why mandarins like to nest close to water. If you would like to see the whole drama (with swelling orchestral music and a commentary by someone with a voice very like that of Jean Luc Picard of the Starship Enterprise) you can see it below.. 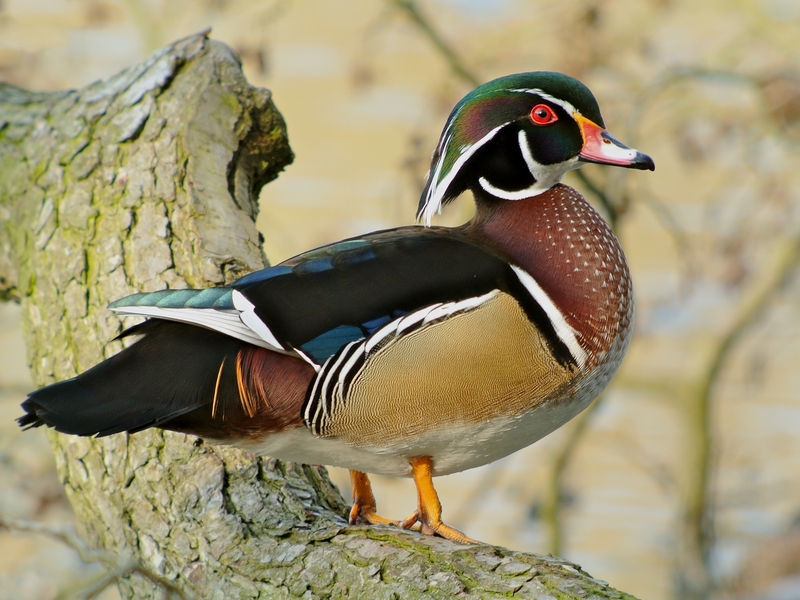 The only close relative of the mandarin is the Carolina wood duck (Aix sponsa), another extremely handsome bird that rears its young in the same way. The wood duck is often seen in wildfowl collections, but for some reason it doesn’t seem to have ‘jumped over the fence’ like the mandarin. Just as well, what with that shortage of nesting holes. 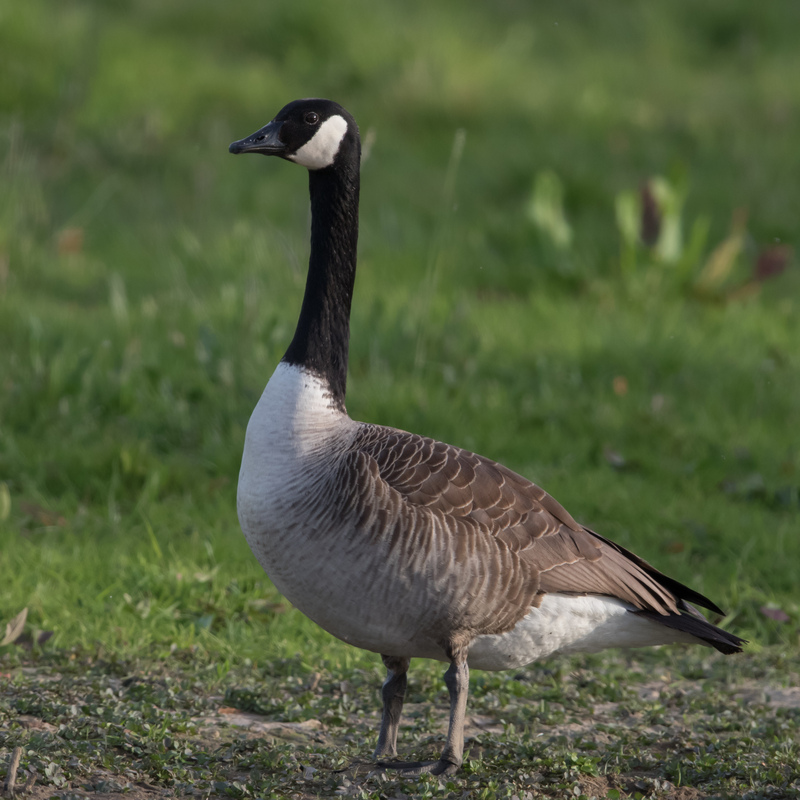 Of course, the most ubiquitous, the most hated and the most belligerent of all our introduced wildfowl has to be the poor old Canada Goose (Branta canadensis). It is big, noisy, and breeds like billy-o. You can blame King Charles II for the original importation, Strangely, the bird’s numbers were low until the latter half of the 20th century, but now this is probably the most recognised bird in the London area after the feral pigeon. Many a toddler has been knocked over as the leathery beak of a Canada goose snatches the last crust intended for the duckies, but the birds have a determined and straightforward nature that I can’t help but admire. Nonetheless, they foul the grass and are accused of causing the eutrophication of waterways. I sometimes wonder if a major factor in the fouling of water bodies is not so much the geese themselves as the extraordinary amount of bread that folk throw into the ponds and lakes, which not only encourages the birds to congregate but adds to the general muck when it isn’t eaten. And while we’re on the subject of feeding bread to ducks and geese, it can cause a syndrome called Angel Wing, as seen in the bird below. Angel wing cannot be cured unless the bird is very young, and it renders the creature unable to fly. 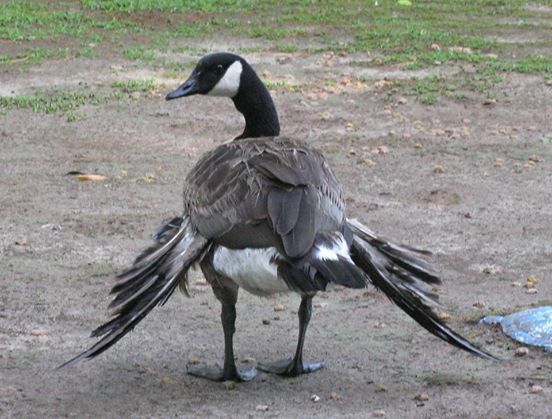 It’s no surprise to me that a Canada goose that can’t fly has survived to adulthood because, well, attitude – have you ever tried to mess with a Canada goose? I wouldn’t recommend it. We’ve all gone to the local pond and fed the ducks and geese bread and cake, and they’ve seemed happy and healthy. But the trouble is that when the food is easy to get, most animals will just hang around and wait, or spend their days eyeing the riverbank with a hungry eye. Wildfowl are largely omnivorous – grazing, eating water plants, grubbing away at the bottom of the pond with their sensitive beaks, even diving for food. When humans intervene, they end up with stale Battenburg cake and a few slices of Wonderloaf. Our joy at being able to feed animals should surely not trump their welfare, and just because we’ve always done something doesn’t mean that we should carry on when we find out that it’s doing harm. When we know better (myself included) we do better, surely. b) Lettuce, rocket, micro greens. Ducks won’t mind the tatty bits on the outside. f) Rice (raw or cooked, but no egg-fried rice please. That would be cannibalism). 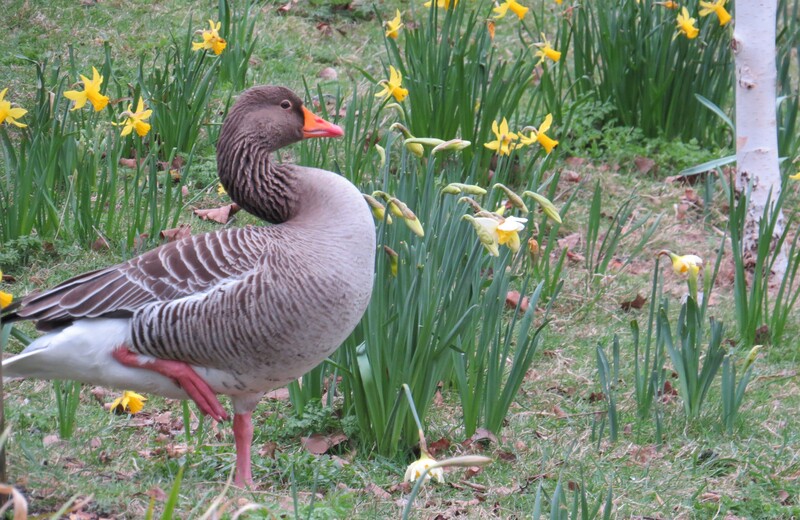 And if you go to Regent’s Park with your largesse, you might find some very interesting birds to feed. I am always surprised at the sheer variety of wildfowl that turn up, especially in spring and autumn, on even the most uninspired local pond. Fill your pockets with frozen peas (defrosted) and have a brief trip back to childhood. It’s even more fun if you are accompanied by an actual child. Hooded mergansers (Lophodytes cucullatus) from North America. What delights they are! The female looks very determined. This entry was posted in London Birds on April 21, 2018 by Bug Woman. I love this! We have a pair of Egyptian Geese in Wapping, they started trying to nest on a river pontoon last year but this year have moved to the ornamental canal. Unfortunately for the people who live on the canal, as they really do make the most horrific racket… But they are so beautiful I can’t be cross with them. And they are quite unconcerned by people wandering past. Glad to be of service, Fran and Bobby – I think that the Egyptian goose is still unusual enough to attract attention, though I suspect that they are expanding their range with some enthusiasm. It is very interesting of itself and made more so when commentators respond and even join in with pictures.